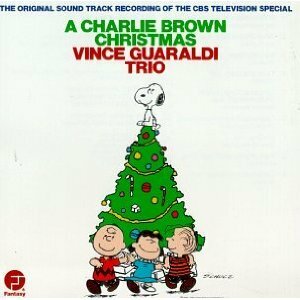 Listen to this track, a classic Christmas melody from West Coast jazz proponent and Charlie Brown soundtrack purveyors Vince Guaraldi Trio, featuring Guaraldi himself on piano. It’s “Skating”, a piece is featured on the soundtrack of Charlie Brown Christmas, a TV special first broadcast in 1964, and since a part of everyone’s Christmas viewing pleasure into our Twenty-First Century. Vince Guaraldi was an established jazz pianist and plugged into the West Coast jazz scene from the 1950s, having played with Vibraphonist Cal Tjader on one of my favourite West Coast jazz albums, Jazz at the Blackhawk. He was an established recording artist even before his work on the Charlie Brown Christmas project, but his music – lyrical, accessible, and somehow perfectly capturing the whimsy and innocence of the subject matter – would be his greatest impact as a part of many a childhood, and across generations of holiday TV special enthusiasts. The West Coast sound in jazz as developed in the 50s and early 60s is a formalized form of cool jazz, rooted in classical music, with a lighter and airier feel to it that separates it from East Coast hard bop. And Vince Guaraldi was a major proponent of it, signed to Fantasy Records, which was also one of the early labels that had put out Dave Brubeck’s records before Brubeck signed with Columbia. The lightness of touch as found in ‘Skating’ is just what the material needed to capture that feeling of a calm, wintry day on a frozen pond, skating with friends. And that’s what Guaraldi’s soundtrack managed to do with incredible precision; to create a timeless soundtrack not only to this Christmas special, but also to childhood itself. That’s what this piece, and other pieces like the famous ‘Linus and Lucy’ stand for, particularly at this time of year. Guaraldi’s musical legacy would be forever associated with Charlie Brown specials, scoring sixteen soundtracks before his death in 1976 at the young age of 47. Yet, it must also be noted that he was a tremendously gifted pianist and composer across the board, making the tried and true piano-bass-drums set up into one that truly captured the essence of childhood without talking down to his audience musicially speaking. This is jazz, after all. And Guaraldi knew better than to dumb it down for the kids. For more information about Vince Guaraldi, check out the Vince Guaraldi official site. One of my absolute favourite Christmas albums! The music is timeless, as is the show. The irony is of course that even though the track is called “Skating” it’s actually used in A Charlie Brown Christmas in a scene where the kids try to catch snowflakes on their tongue and throw snowballs at a can– and do everything *but* skating! I’ve said this elsewhere, but I think the greatest testament to Guaraldi’s music is that “Skating” is now considered a holiday standard, played in shopping malls around the world. It’s now traditional Christmas music!